Use Energy Snapshot to receive a comprehensive analysis of your home's energy use and identify your personalized cost-saving opportunities. For a quick review, an initial Energy Snapshot report is provided after completing just 8 questions. Your Energy Snapshot report is based on the information you provide along with informed assumptions consistent with your entries. Click on the various tiles found on the Energy Snapshot dashboard to review your home's energy usage and find personalized energy-saving recommendations. You can use the blue navigation tiles on the left side of the page to move to the individual appliance data entry pages and provide more detailed information about your home. Because your Energy Snapshot report is saved for your future reference, please register and create a user name and password. The process is quick and your information is kept confidential. You can review your home's report at anytime, update it or even create additional Energy Snapshot reports for other residences. Your home's information is being processed and will be viewable in your personalized Energy Snapshot report. Use the Energy Snapshot™ dashboard to immediately view key results and to navigate the individual clickable tiles to access the pages in your report. Begin by clicking the orange Home Review tile. Review the data and assumptions used in your report. If any information does not match your home, please click on the blue navigation tiles to go to any Appliance Category entry page and update your information. The more information you provide, the more comprehensive and accurate your report will become. Each time you click the Energy Snapshot button your entire report is recalculated and updated. When you are satisfied that your information is complete, return to the Energy Snapshot dashboard to continue your review of your comprehensive report and find personalized energy tips and recommendations. Atmos Energy is engaged in regulated utility operations and in complimentary non utility business. 2017 Atmos Energy Corporation. All Rights Reserved. "By entering your full 18-digit KUA account number you will allow this tool to automatically import certain non-personal information from your current electric bill to significantly increase the accuracy of your results. 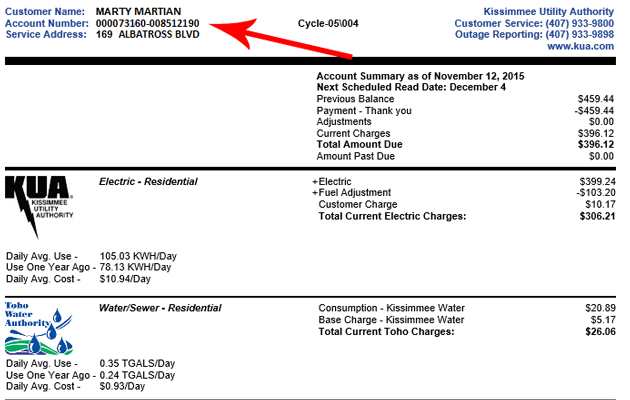 The image below is an example of your KUA electric bill. Your Account Number is located at the top left corner beneath your Customer Name. For best results, enter the full 18-digit number (EXAMPLE: 123456789-987654321), including the dash ("-") just as it appears on your bill. You must enter either a gas account number or an electric account number.